If you give Autumn a chicken coop, she’ll probably want some chickens. If you give Autumn some chickens, she’ll probably want some more. If your chickens start to lay eggs, your friends will probably want some eggs. If your friends want some eggs, their friends will probably want some too. If your friends’ friends want some eggs, you’ll probably need more chickens. If you want some more chickens, you’ll probably need some more coops. Translation: We’re building not one but two additional coops so that eventually we can have three separate thirty bird flocks. By keeping three separate flocks, we’ll be able to sell eggs for consumption, hatching eggs, chicks and full grown chickens. And we are really effing excited! We already have one coop that was built by the previous owners. It’s at the end of a very long pastured run, running parallel to our road. So it made sense to build two new coops down the road, in line with the existing coop. This way, all the of coops are close to the house, within eyesight and easily accessible. And it just looks nice to drive up the road and see “chicken coop row.” We planned out the site of the two individual coops, making sure that they’re not in the way of any trees and are able to get a lot of sunlight. Planning out the site of the coops. 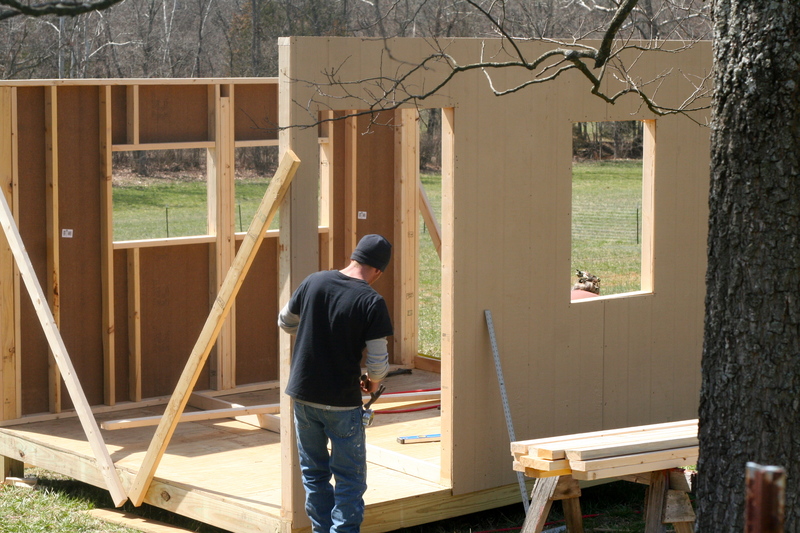 For the basic structure of our coop, we’re essentially building two 10’x12′ sheds with a single pitch metal roof. 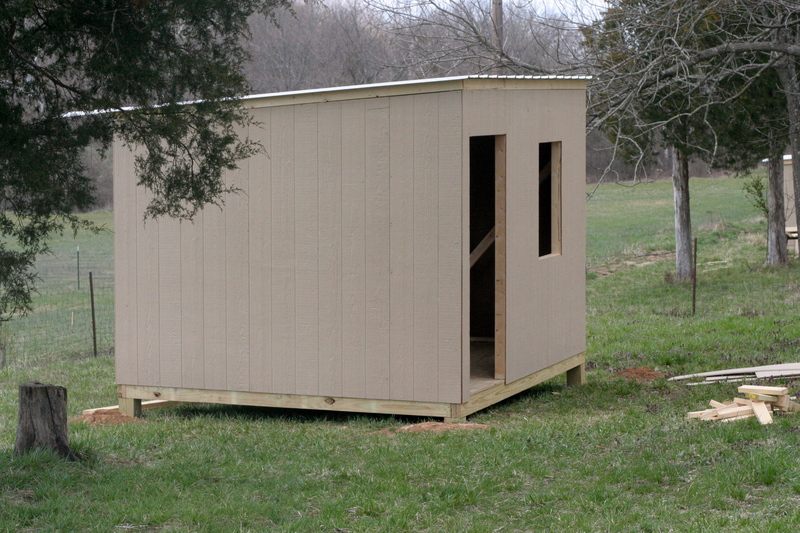 Once we have that built, we’ll be able to customize it into a chicken coop. We’re putting in two windows on the south side of the coop to let a lot of sunlight in. The door and a single window will go on the north side of the coop to allow for cross ventilation (a must have for chicken coops). 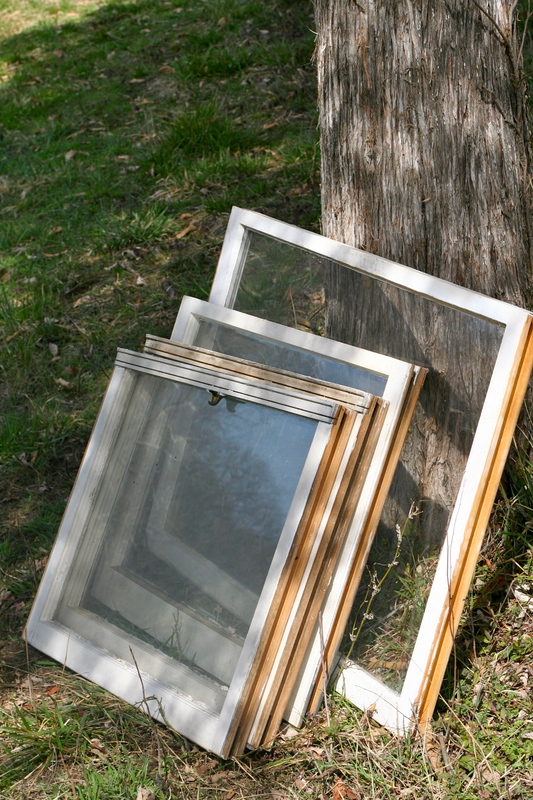 Luckily, we replaced some of the windows and doors on our house a little wile back so we were able to use the old windows and doors for our chicken coops. Now that we had all of our materials together, Denny started going to town on the coops! Denny is the frigg’n man! He’s Tuckers step-dad, and is also one of those old school country “knows how to build and fix EVERYTHING” type of guys. Dave used to work for him back in the day welding fire escapes before he started working on the Cassilly Crew at the City Museum. Denny is one of the very few people we will ever hire to build somthing when we get to busy to do it our self. He’s damn good at stuff and hooks us up with the super family discount. 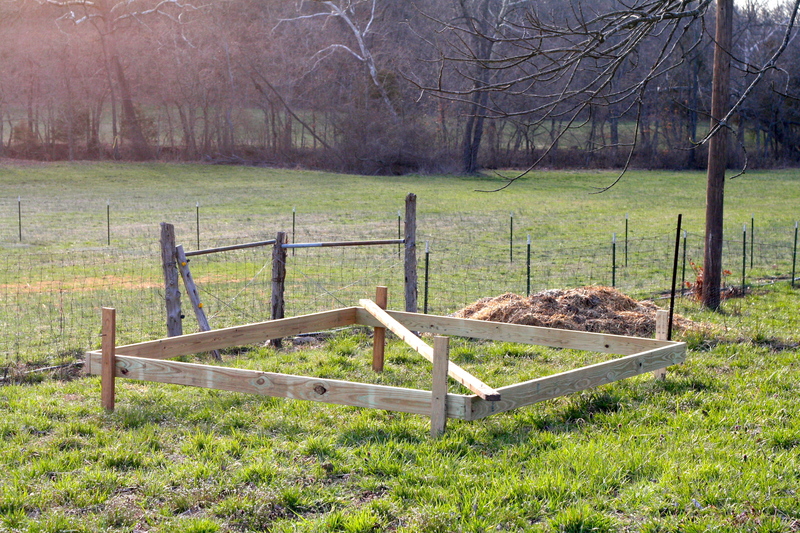 Anyway, after we decided on the placement for the coops, Denny and Aaron (Tucker’s brother) leveled the frames and dug out holes for each corner post. 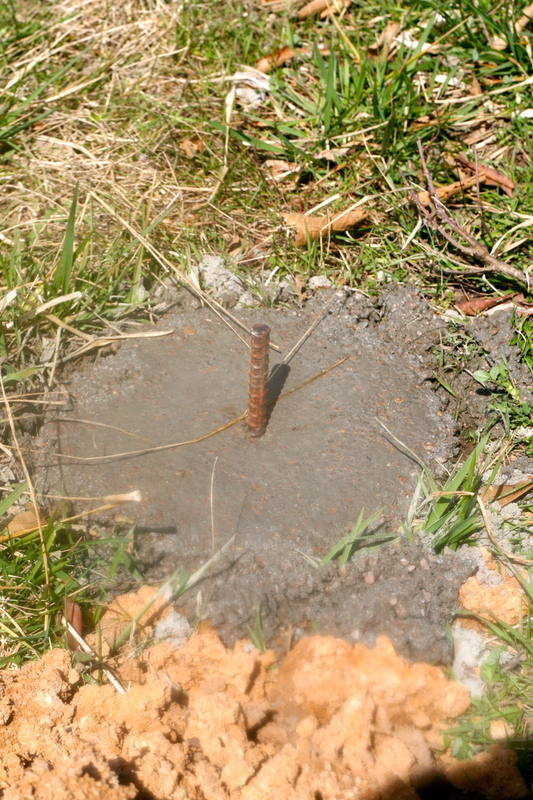 After each corner was dug, they set a piece of 1/2 inch rebar plumb in the hole and filled it with concrete. Then they drilled a 1/2 hole in the 6X6 inch pressure treated beams that will hold the coop and filled the hole with epoxy. The 6X6’s then get slid over the rebar after they are cut so the tops are all level with each other. This will make a solid flat foundation for the coop. Filling each post hole with concrete. After the posts were set, they laid the floor which is just pressure treated wood. The chickens aren’t going to need anything really fancy, just something that will hold up against weather, water and varmints. The walls get built on the ground then stood up and nailed in place. We decided to put two windows on the south side of the coop to let in lots of light and the door and another window on the north side of the coop to allow for cross ventilation. We went with a metal roof instead of a shingled roof because we’re installing a rain barrel system. Harvesting rain water from a shingled roof may leach asphalt and tar sediment into your water, which is no good for chickens. Metal roofing, however, collects a larger volume of rain water (because they are impermeable) as well as cleaner rain water. But I’m getting ahead of myself… more about rain barrels in another post. 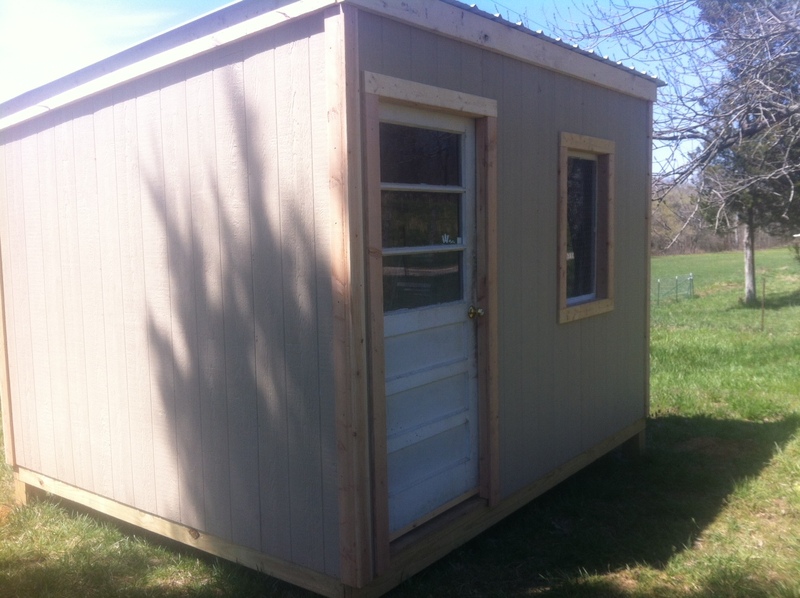 So that last step of phase one of the chicken coop was to install the windows and door. 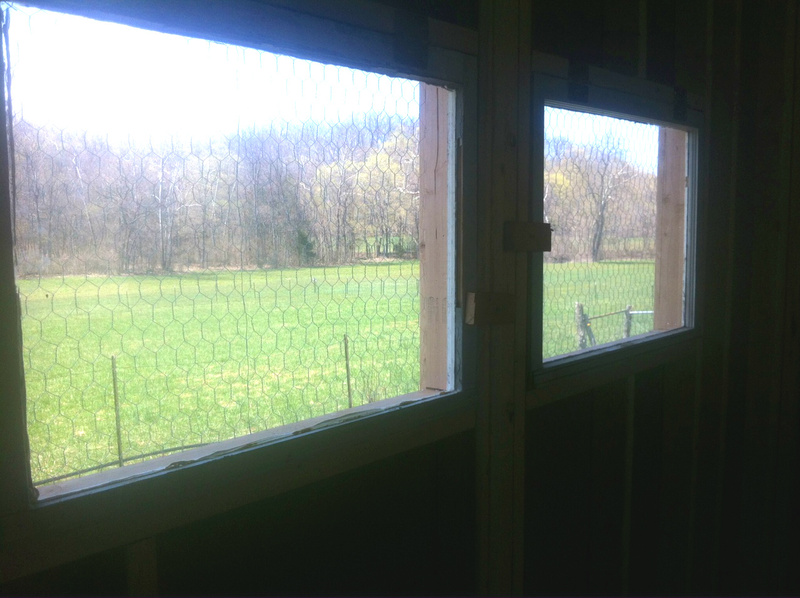 Denny installed the windows inside the coop with hinges so we can open the windows during the summer and keep them closed and sealed during winter. It’s a little dark, but here are the two windows. Denny also added chicken wire to keep predators’ grubby little hands and teeth out of the coop. 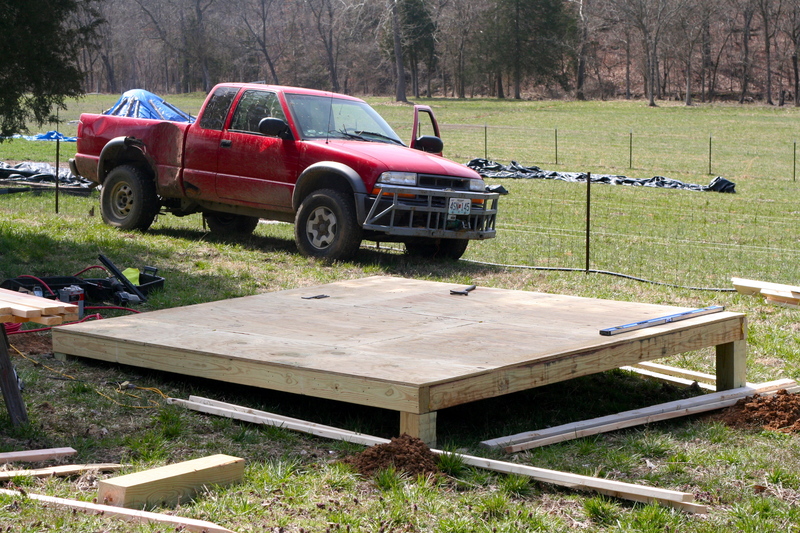 Stay tuned for Part 2 of our chicken coop construction! So awesome! I love that you will have 3 separate coops. It looks great and seems very functional too!